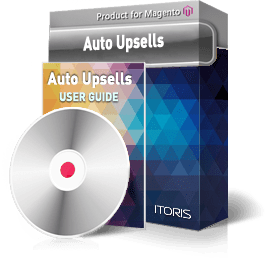 Generate upsells’ lists automatically and entice your customers to get upsells at higher prices and from different categories using the Auto Upsells extension for Magento. Choose upsells in a current category automatically or select categories for each product manually. Let your customers get relevant results only by showing bestsellers, specifying a price range and choosing categories. Upsells help you sell a more expensive version of a product or offer extra features to that product. There is no need to spend a lot of time and add upsells to each product manually. The Auto Upsells extension creates upsells’ lists automatically and shows higher priced alternatives to the products. How does the extension provide the relevant results? Firstly, the extension moves the bestsellers to the top of the upsells’ lists to form the most popular offers. Secondly, the extension searches for the products included into the specified price range. You can offer the customers more expensive products and select a current category or choose multiple categories for each product manually. Then define the final number of upsells to be displayed on the Frontend. The Auto Upsells extension is a fast tool allowing you to save your time and offer the popular products at higher prices. Optimizing upsells can be time-consuming using the out-of-the-box Magento functionality. Now the Auto Upsells extension automates this process which allows you to carry out other important tasks. You can easily apply upsells’ lists automatically by replacing the existing upsell items. If your products have recommendations you can skip auto upsells and apply them to other products. Choose upsells automatically for products without losing the existing lists. You can configure these settings for all products globally or for each product manually. The extension helps to configure the upsells’ lists for each product manually. In case if you need to change the price range or select multiple categories, such functionality is available per product. Let’s say you want to offer the customers a more expensive laptop with extended features than the current item has. Specify the price points and define categories the upsells should be taken from. Offer the customers upsell items at 30% higher. You can change these values globally or for each product by specifying the price points in the settings. Add upsells from different categories and suggest buying more expensive items from a certain category. The available category tree allows you to choose several categories at once. The extension shows more relevant products by moving bestsellers to the top of the upsells’ lists. Define the number of upsells to be chosen from the X bestsellers. Specify the maximum number of upsells shown on the Frontend. As a result, the most profitable offers will be available for the customers. Help your customers get what they want by offering relevant recommendations.